Are you looking to find a good weed stash bag you can use to store your cannabis in? If you are, you’ve come to the right place. This article will highlight everything you need to know about these products with some helpful tips and some product suggestions you can consider investing in. Below you’ll find more information about what you need to look for when buying them, such as if the bag is smell-proof and its overall design to ensure you invest in the best one for your needs. Keep reading to find out everything you need to know about these stash pouches. What is a Weed Stash Bag? A weed stash bag is a creative way you can store and transport your cannabis with. It comes in many different sizes and designs so everyone can find something that matches their preferences. It’s also often smell-proof so cannabis odors won’t leak out and sometimes features cushioning inside it which is intended to help prevent any weed smoking equipment you’re carrying around in it from breaking. Why Use a Weed Stash Bag? At first, some might be a little confused as to the point of using a weed stash bag. Why should I invest in such an item? The answer is that it can help you to stay more discreet when you use your weed stash bag. Below are some other awesome benefits you can get when you use a weed stash bag. Many weed stash bags often come with secret compartments. These will allow you to hide things inside them while keeping them safe. So, if you want to make sure everything inside your stash bag is safe, look to see if it comes with a secret compartment. Another great thing about weed stash bags is that they come in a variety of unique designs. You’ll find ones made with solid colors and others with creative patterns. This means you’ll be able to find one that matches your preferences perfectly! The top reason why many use a weed stash bag is because they are extremely discreet. This way, you can put them in your pocket to carry them around or in the open without anyone taking a second glance. Many so-called weed bags claim to be durable, but tend to be somewhat flimsy. This is especially so with the zippers. However, many weed stash bags come with strong zippers so you don’t need to worry about them slowly coming undone by themselves. 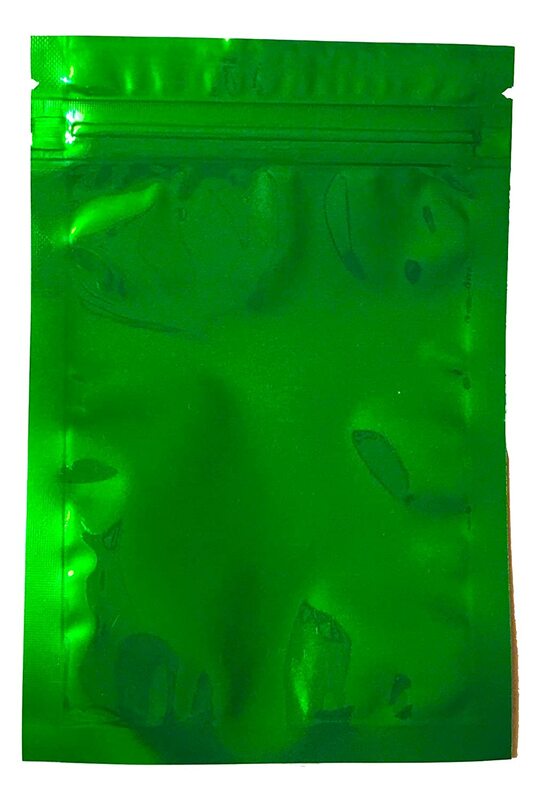 Many weed stash bags come with special smell-proof liners. This helps to prevent odors from leaking in or out of your bag. This can help you to keep things discreet when you carry your weed stash bag around. A smell-proof stash bag is very important when it comes to smoking. As mentioned above, they can prevent odors from escaping making it easy to keep your stash discreet. This makes them perfect for those who truly want to keep their stash and smoking private. Another great thing about weed stash bags is that they come in many different sizes. This way, you can find one you can discreetly carry around in your pocket, or one you can transport around like a purse or bag. Because of the variety available, you can be sure you’ll find one that fits your needs perfectly. Despite these products being compact, they are actually pretty spacious inside. This means you can easily fit all of your materials (grinders, weed, etc.) inside without problems. While compact, you’ll find they come in various sizes so you can find one that might be a little large or small depending on your needs. There are a few vital things to look for before buying stash bags and wallets. Below are some of the most important things to consider before buying any model. One of the most important things to look for when buying these products is if it’s smell-proof. A weed stash bag that’s not made with a thick fabric can end up letting odors sneak through which can alert others to what’s inside your stash bag. You’ll want to check to make sure the fabric is thick and will prevent any odors from escaping so you can use and transport your bag around without others knowing. One new feature in many of these bags is carbon technology. This technology is made to ensure that air doesn’t get into the bag to affect your cannabis and the weed odors don’t escape from the bag. This technology uses carbon particles to help filter out any smells that might be in it. The carbon absorbs any odors and stores it away so they don’t escape. Why Does Carbon Help to Absorb Odors? Carbon surprisingly helps to absorb odors thanks to its strong components. Carbon can capture over 90% of the carbon dioxide emitted. This means that smells and toxins in the air won’t linger around. Because of this, many weed stash bags incorporate carbon technology into their designs. It will not only help to protect you, but ensure your weed stash bag doesn’t smell. So, when shopping for a stash bag to keep your contents in, make sure it will keep odors from forming. If you plan to carry your bag around often, you’ll want to definitely look at its durability. A bag that’s made out of cheap materials often won’t last long which can let odors leak out and might even damage any equipment you plan to carry around in it. If you want a durable stash bag, it might cost a little more than other models, but you can rest assured that you won’t have to worry about it breaking and having to invest in a new one anytime soon. Another thing you’ll want to look at is the weed stash bag’s design and size. You’ll find large and small bags that come in a variety of colors and designs. If you want to carry a lot of things around also make sure that there’s enough room inside to do so and that there are pockets you can keep the things in to prevent them from shuffling around inside the bag. Cushioning is a good thing to look for as it can prevent the items inside from moving around and prevent them from breaking due to any heavy impact. Foam cushions will help to protect your equipment so look closely at any model you’re interested in to see if they have foam cushions. If you want to have extra security for your weed stash bag and be sure that no one sneaks into it, you’ll want to look for a lock built. Many models offer this and can come either as a separate piece or are sewn into the bag. Usually, a lock will have a combination you can use to help better protect your stash inside. Another important thing to look for is if the weed stash bag has anti-bacterial lining inside. Sometimes the bags can end up getting a stale smell due to the contents. This is often caused by humidity and other factors. An anti-bacterial lining will work to help not only clear these odors out, but prevent germs and other nasty problems from forming in your weed stash bag. 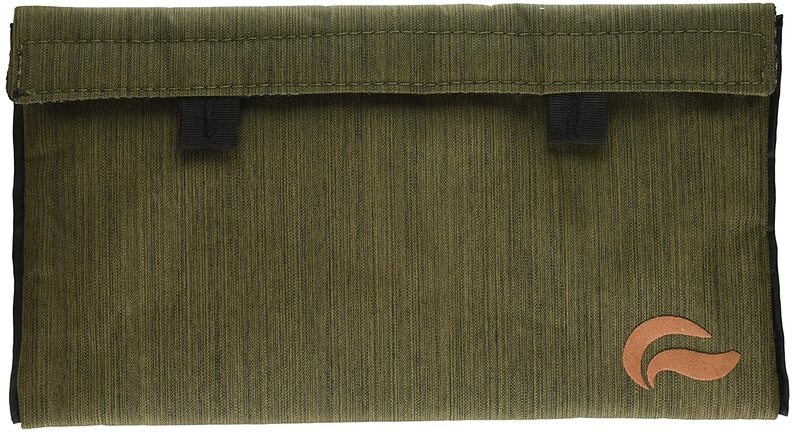 This Skunk Mr. Slick bag measures 11 x 6 inches and features a sleek olive green fabric. It’s made with a special carbon technology which helps to prevent any smells from escaping when you carry weed around in it. This makes it one of the best models to consider investing in if you’re looking for a smell-proof product. In addition to this, it also has 2 tabs sewn into the edge that have a strong Velcro seal to help prevent anything from falling out. However, while this Velcro strap can be helpful it can also cause some problems as it’s very strong and might make trying to open the bag a little difficult sometimes. 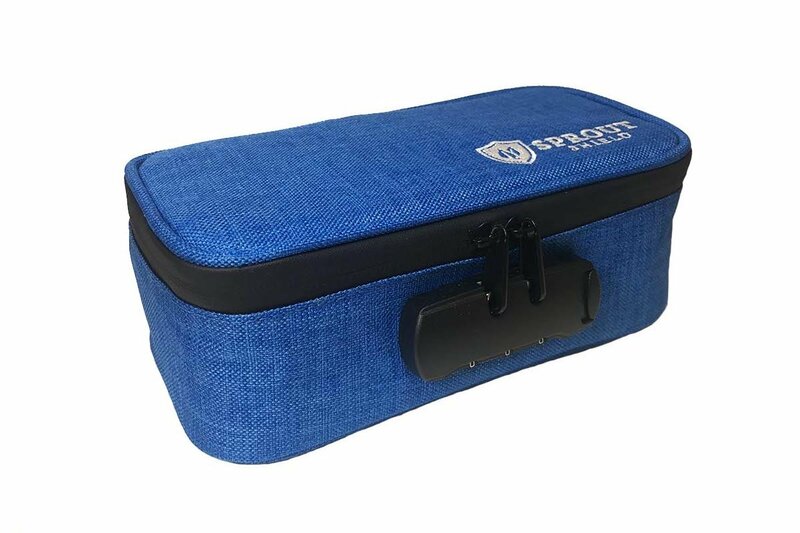 The Sprout Inc. Stash Bag is made with a blue fabric that features a black trim around the edges. It’s made with carbon technology to help prevent odors from escaping and air from seeping into the bag to affect your weed. This bag also has a unique design feature which is that it has a built-in combination lock in the front which you can use to ensure nobody gets into your stash bag. Keep in mind though that sometimes this lock can be a little stubborn and not always open quickly. This heavy-duty bag is a little on the pricey side, but it’s made to last. 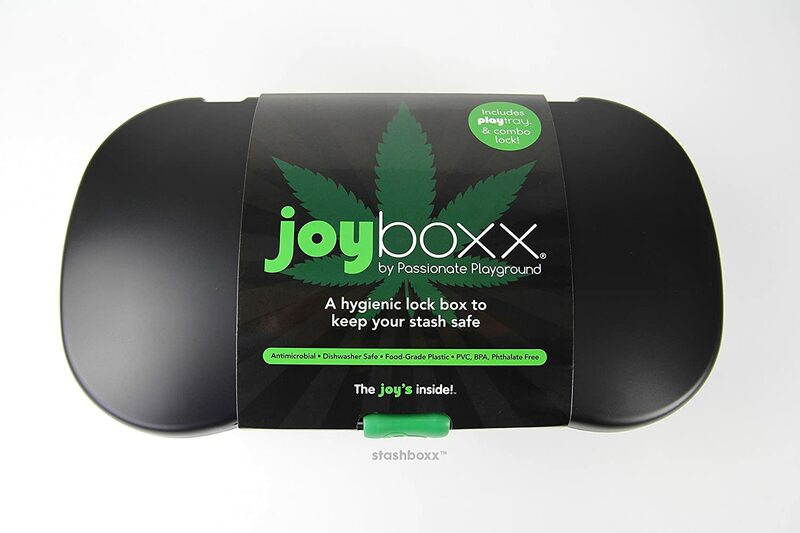 The Joyboxx Stashboxx is made out of plastic that is covered in a black design. It’s made to be anti-bacterial so you don’t need to worry about any mold growing inside the bag or in your weed. It also has vents built into it to help with this and ensure the interior temperature isn’t too warm or too cold for the contents inside. In addition to this, it also has 2 locks built into it. These are meant to help ensure you have complete privacy and control over who opens your stash box. Keep in mind that this model is a little expensive so if you don’t want to spend a lot on a weed stash bag, this might not be the right model for you. This stash bag collection is an affordable option for those looking to not invest too much in a product. These bags come in a pack of 5 and measure 4 x 6 inches. They feature a vibrant green color and are designed to be smell-proof. 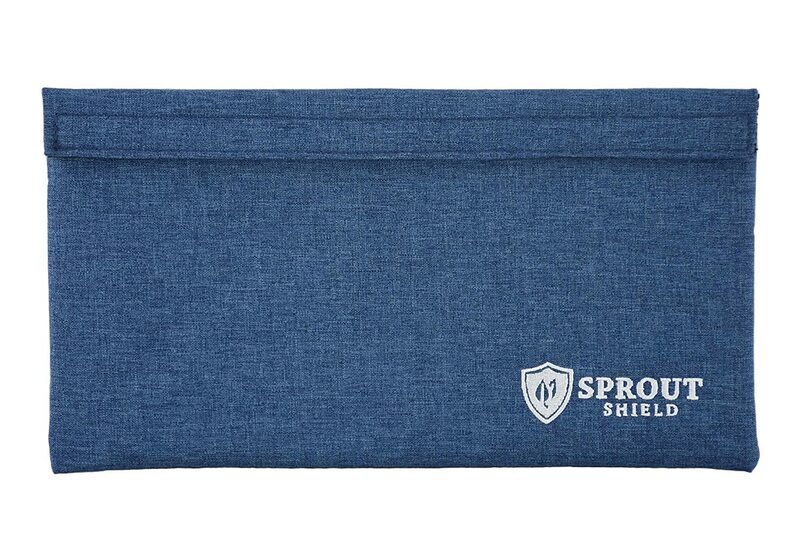 This Sprout Inc. Stash Bag is made with a navy blue fabric that is thick enough to prevent odors from escaping and rips from easily occurring. On the top edge and in the interior, you’ll find Velcro straps inside. These are meant to help keep your equipment from falling out and others from quickly getting into your stash bag. 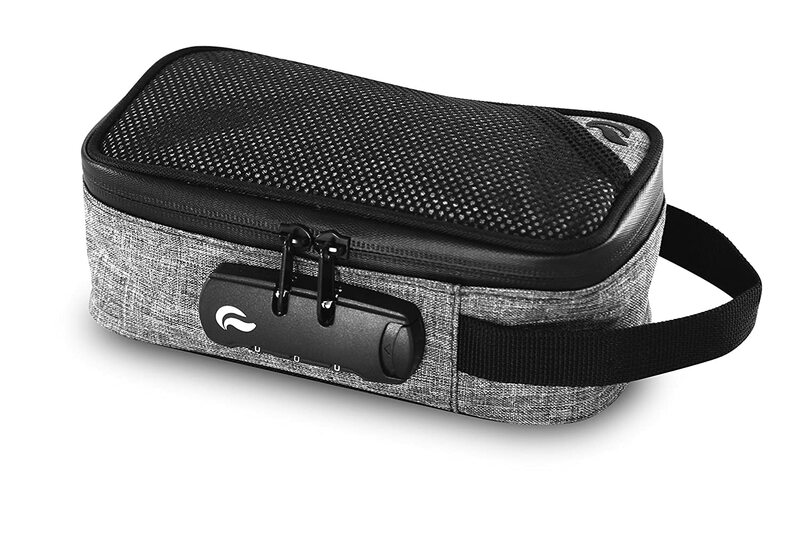 This secure weed stash bag also features carbon technology. This technology helps to prevent odors from escaping so you can transport it around practically anywhere. 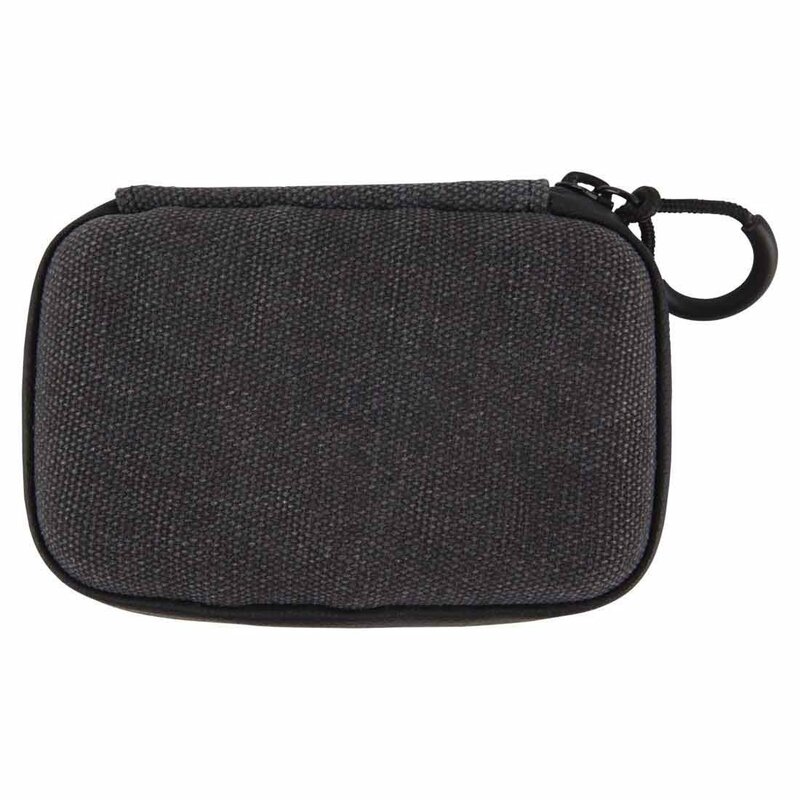 This compact weed stash bag is ideal for those who are looking for a small and affordable stash bag. 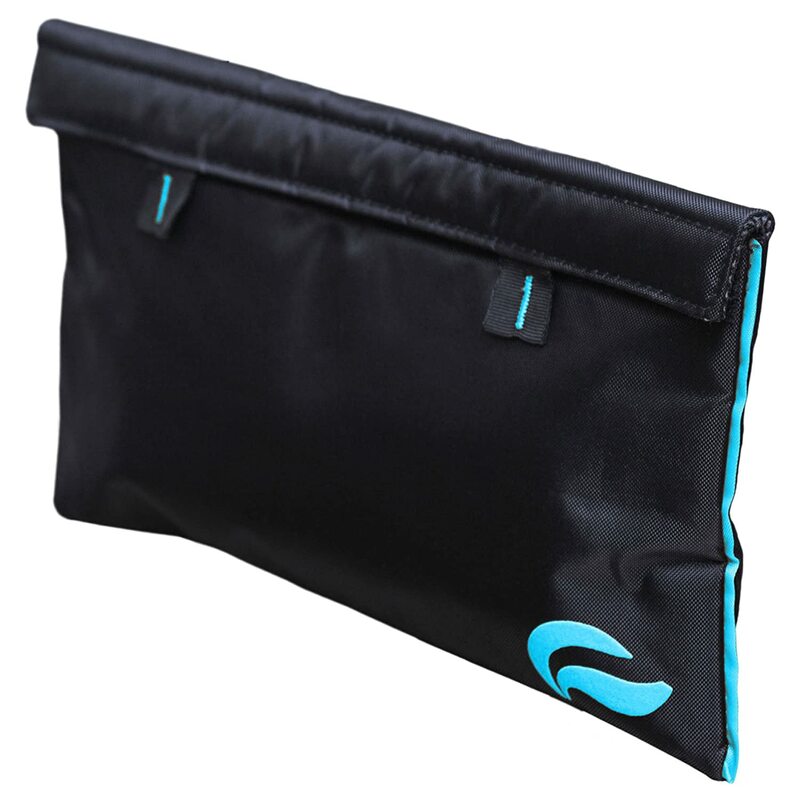 This stash bag measures 11 x 6 inches and features a stylish black and blue design. It’s created with carbon technology which is designed to help prevent odors from leaking out. It also has double Velcro straps sewn into it to help with odor control and security. This stash bag also comes in different sizes and colors so if you don’t like the black and blue design you can choose something that fits your preferences. The Skunk Sidekick is the perfect stash bag for those who want to carry their stash bag around with them. It comes in a few different colors like black, gray, blue, burgundy, and orange, and features a secure combination lock on the outside to help keep your contents inside safe. The bag is smell-proof and comes with an odor filter inside to better help with catching odors and preventing them from leaking out. Inside you’ll also find a few pockets that you can use to store your weed and smoking equipment in. On the exterior, you’ll also find another mesh pocket you can use. This model though is one of the more expensive products available on the market so it’s best for those who are serious about smoking to invest in. The Skunk Travel Pro comes in three different colors: black, gray, and olive green. It measures 10 inches and is very large. This makes it perfect for those who want to carry a lot of stuff around with them to use. The fabric is heavy-duty and features carbon technology which is meant to help with preventing smells from escaping. It’s also waterproof so if you get caught out in the rain or some water spills on it you don’t have to worry about it being damaged. It also has a zipper to help keep your contents secure, however sometimes this zipper can be a little flimsy. While a little on the pricey side, it’s made to last. This makes it a great model for those looking for a durable product. The RYOT SmellSafe Stash Bag is a small option that’s ideal for those who want to be on the go with their stash bag. It’s designed with a hard exterior that features a hard plastic shell. This is meant to help add to the durability of this product. It comes in color options such as black, natural, and olive. It also has a removable fresh pouch inside it you can use. There’s also a loop on the end you can use to attach it to a backpack or other item so you don’t have to carry it. While smell-proof, this product can sometimes leak small amounts of odors. So, if you’re looking for a completely odor-proof product, this might not be the best model for you. When you invest in your weed stash bag, there are plenty of things you can carry around in it. Below are some gear suggestions you can put into your stash bag. To keep your weed in one place and measured out correctly, you can invest in some bags to put in your stash pouch. One bag product you can consider using is the Interplanetary Development Bags. These are smell-proof and measure 4 x 6 inches so they’re pretty compact. They come in a pack of 25 and feature a dark color to prevent the contents inside from showing. Better yet, they’re heavy-duty so you won’t have to worry about them ripping easily. A saverette is the perfect piece of equipment to put away in your stash bag if you want to smoke while on the go. They are a hollow piece of plastic which you can put your joint in if you want to save it for a future smoke. They basically are a way to help you save money while also saving your half-finished joint for a later time. In addition to this, saverettes can help to enhance and keep your joints flavor strong, unlike typical storage units that only cause the flavor to dwindle or disappear. If you’re looking for some Saverettes to invest in, you can check out this product recommendation below. This sleek product by eKomi measures 110 mm long and comes in a black casing so you can easily hide it away in your stash bag. The opening makes it easy to quickly slip a joint into it and the lid can be secured instantly to help prevent air from getting into the container. 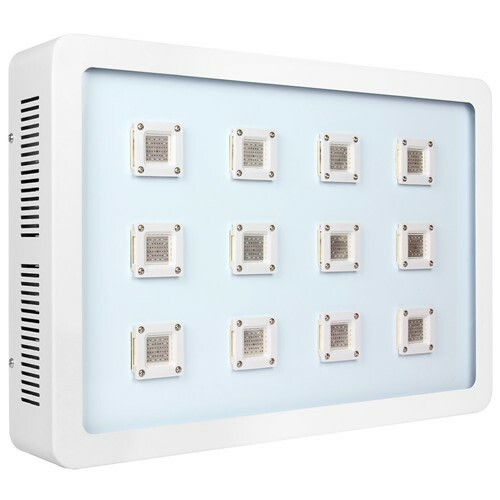 This product is also very affordable making it easy to invest in without fear or breaking the bank. If you want freshly grounded weed, grinders are a must to put into your bag. Unlike trimmers, these come in all shapes and sizes so you can find one that best fits in your stash bag and meets your needs. If you prefer to not use plastic bags to hold your weed, you can use jars. One product you can invest in is the MedicalKush Supply Glass Jars. These jars feature a specially designed lid. This lid is meant to help keep the weed inside fresh and prevents odors from escaping. The jars are also designed to help prevent moisture from seeping in which could ruin your cannabis inside. They come in a pack of 6 and are perfect to store in a small weed stash bag. Why Does Moisture Ruin My Weed? Moisture can be a huge nemesis to your weed for many reasons. It can create a wet and humind environment, something which does mix well with weed. When your weed mingles with humidity it can end up molding. Molded weed is extremely unsafe to smoke (it can damage your immune system) and can destroy the taste many desire with their weed. As mentioned above, moisture is your weed’s nemesis. Because weed stash bags are zipped up and enclosed, they are the perfect place for humidity and odors to form. Because of this, mildew can end up growing. Dark tinted jars are also ideal over plastic bags for a few reasons. The main one being that they keep light out. When light hits your weed, it can bleach it which can cause the color to fade and even reduce the taste. Plastic might be popular, but it’s not good to use if you want to have a serious and enjoyable smoke. If you find that your weed stash bag doesn’t come with a good lock system, you can buy your own. A good product to consider are the SourceOne Mini Locks. These locks come in a pack of ten and are very durable. This way, there’s no need to worry about them breaking or giving easy access to your stash bag. You can open them up with the set of keys that come with each lock. 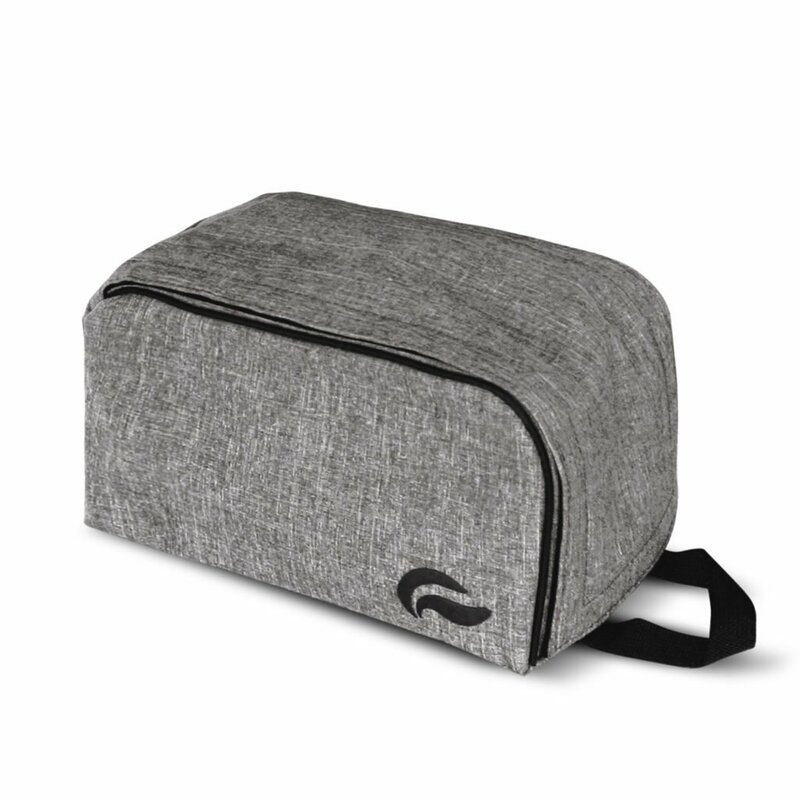 Weed stash bags are great products to use to store your cannabis in and transport it around. They’re made with many different materials and designs as well as various price ranges. This means everyone can find something that suits their needs. So, if you’re looking to invest in a stash bag, definitely consider the products mentioned above. Also keep in mind the tips mentioned to ensure you invest in the right one for your needs.